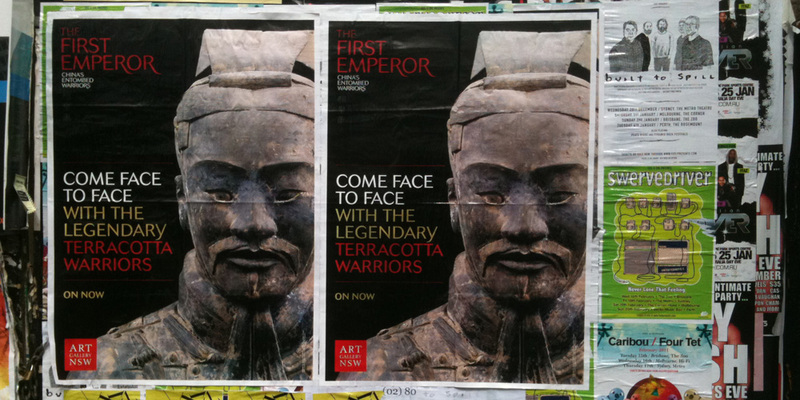 I created four digital media elements for the Art Gallery of New South Wales major summer 2010/11 exhibition “The First Emperor – China’s Entombed Warriors”, visited by over 300,000 people. The following notes provide further detail to each of the digital media elements. 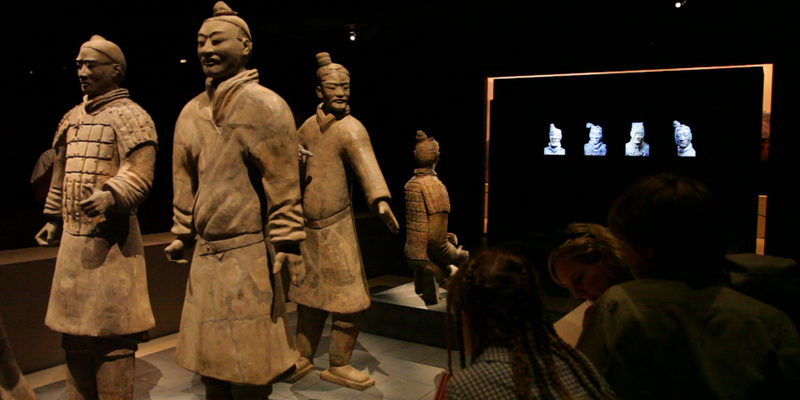 This video provides glimpses of various activities at the huge complex of buildings and facilities in Xi’An, Shaanxi province, China, site of the ongoing work of archaeology, conservation and exhibition of the extraordinary relics of first emperor Qin Shihuang (259–210 BCE). Brief sequences show the anticipatory excitement of visitors walking across the vast square toward the hangar-like construction housing the enormous “Pit No 1”; the wide-eyed fascination of crowds within the hangar; groups’ attentiveness to explanation provided by gesticulating guides; the pulsing flashes of hundreds of hand-held digital cameras; the perpetual surge and flow of thousands of visitors. 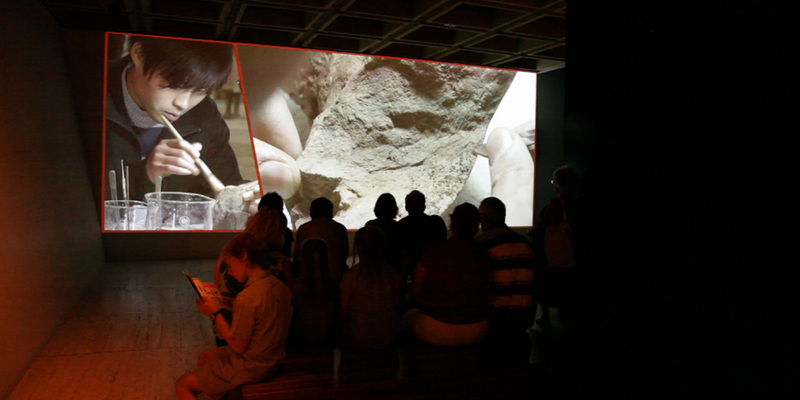 This frenetic performance of fascination is contrasted with scenes of the careful, obsessive cleaning of shards and fragments by seated conservators working at lamplit tables within the pit area – giving a clue to the time and attention needed for each reconstruction. Punctuating these ‘live-action’ sequences are brief black-and-white glimpses of the warriors as archaeology, lying broken and partially unearthed. There is a melancholy quality to these images, evoked by the fixed stares of individual warriors peering across time from within the cold earth. Each face seems to convey a sense of static emotional engagement, from fierce determination to sad resignation. The intention is simply to convey a sense of the site as it exists today, in the early 21st century, before visitors enter the exhibition where their imaginations are carried 25 centuries back in time and half-way across the earth. 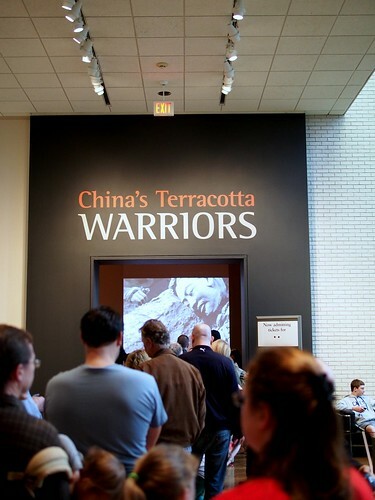 Over a period of seven minutes, sixty head-and-shoulders photographs of warrior figures are displayed. Slow fades-to-black wipe from right to left across the set of monitors, punctuating the various views of front, back and sides of warriors heads. The pace is slow, allowing the visitor to study each face in turn, imparting the fact that each of the thousands of warrior figures represents a different man. 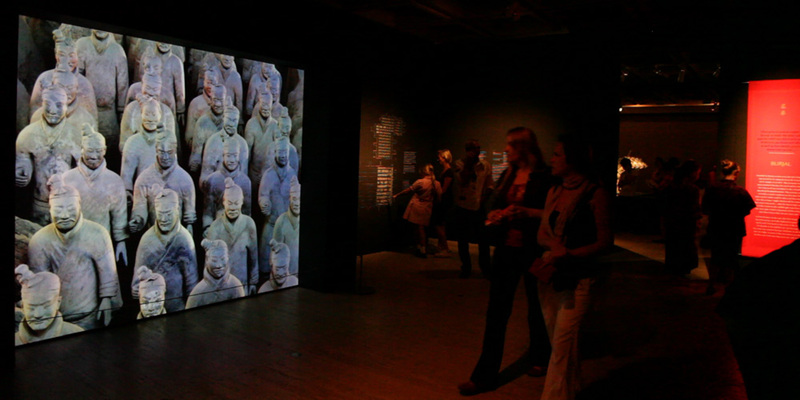 The row of four images mimics the arrangement of warriors in the vast “Pit No 1”, where columns of figures stand four abreast. A sequence of photographs moves slowly through images of half-buried fragments to ‘wide-shots’ of the vast array of standing warriors as they are presented today in Pit No 1. 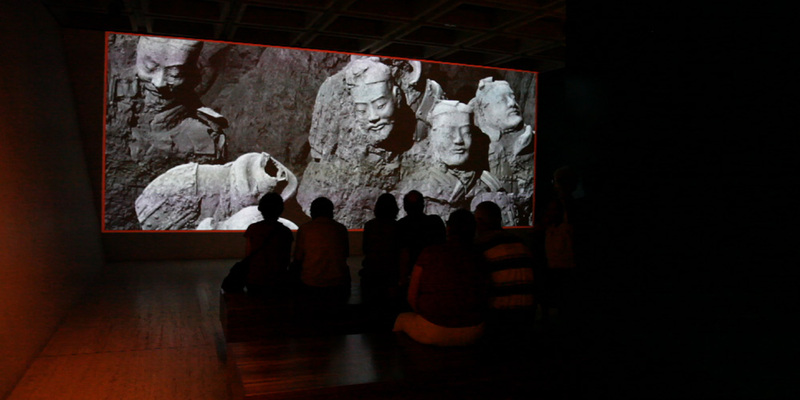 These gently moving images provide the visitor with some sense of the extraordinary scale of the underground terracotta army, the diversity of warrior types and individuality of each figure. The video also points to the painstaking work required to raise each figure from the buried jumble of fragments. The slow pace of “Portrait Studies” and “Pit No 1” allows visitors time to contemplate each image in turn. The sequences are designed to integrate with the original multi-speaker soundscape composed for the exhibition. The soundscape for the central hall comprises five musical compositions accompanied by eleven shorter ‘atmospheric’ field recordings. From four speakers installed high up in the corners of the two-storey void, these two sets of stereo tracks play simultaneously in random looping sequence. The music wasn’t composed in any traditional sense – there wasn’t a score or any form of notation used. Rather, sounds were derived from found field recordings including Chinese musicians playing traditional instruments, ancient bronze bells and a Taoist ceremony in a remote mountain village. Various digital techniques, including time stretching, pitch shifting and reversing, were used to arrange slowly evolving melodic or chordal sequences with two or more layers of instrumentation. We discovered an intrinsic sense of the original tonality and harmonic quality of the instruments was retained, creating an indirect musical reference. Working in this way led to interesting musical accidents where unexpected harmonic interactions occur between unrelated recordings. The volume of each “instrument” within a piece varies over time in a slow organic way, producing alternate passages of quieter openness and louder complexity. The various “instruments” also move spatially through the stereo field, drifting away from or toward the listener. Sound atmospheres accompany and complement the musical sequences. These represent the elemental forces of fire, water, air and earth, providing a subtle cinematic quality to the listening experience. Sounds of rustling bamboo, forests at night, wind over sand, rainfall, insects and native birds drift in and out, creating shifting ‘sound sketches’ redolent of scenes in Chinese nature painting and the recluse poetry tradition. 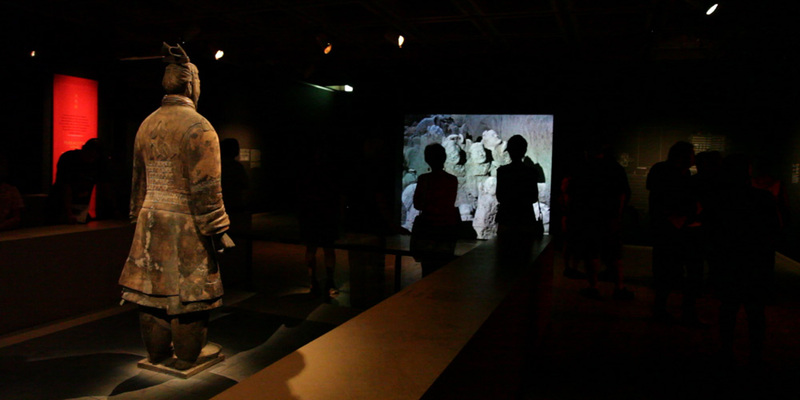 The intention is to create an evocation of emptiness, stillness and slow change conducive to a meditative experience – to arouse an emotional response in the visitor to the Entombed Warriors exhibition, as they contemplate the ancient figures standing motionless in the dimly lit cavernous space. 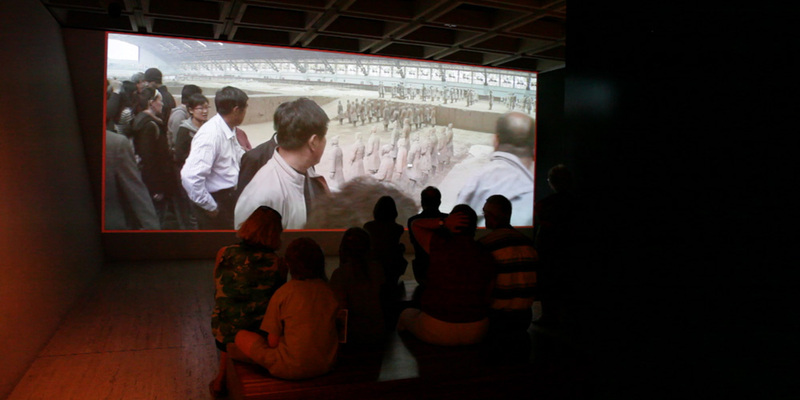 footnote: The media I created for this exhibition was subsequently installed at the Minneapolis Institute of Arts in the exhibition ‘China’s Terracotta Warriors: The First Emperor’s Legacy’, October 28, 2012 – January 20, 2013. Appreciation to flickr member mgtelu for posting the photo of the entrance to the exhibition in Minneapolis, showing a frame from my video through the doorway.